Keep these liqueur- infused cupcakes away from the kids. Unless you’re looking to get them sleepy. Preheat oven to 190c or gas mark 5. Beat all ingredients for the bases except the Bailey’s, together. Drizzle the Bailey’s in last, though do not over mix. Spoon the batter into cake cases. Bake for around 15-18 minutes. The centers may erupt like little volcanoes but that’s ok, you can cut off these peaks if you want to ice them flat or pipe icing in a spiral to emphasis their shape! Leave to cool in the tins for a few minutes before transferring to a wire rack. Allow to cool completely before frosting. 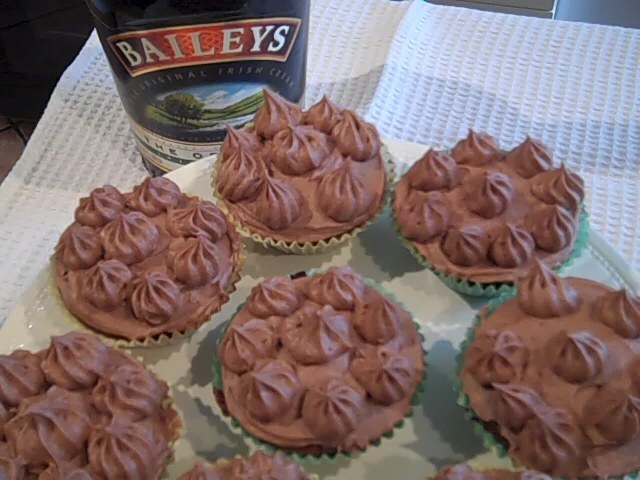 For the frosting, beat the softened butter and Bailey’s with an electric hand mixer until very soft and fluffy. Sift on the icing sugar and cocoa several table spoons at a time and incorporate. When all the icing sugar is mixed in, add another tablespoon of milk (or Baileys) if you think it’s still too stiff. Beat the frosting for several minutes, it will go fluffier and lighter. Remember that although it will be soft and squidgy now, the surface of the frosting will go harder when it’s had a couple of hours to dry out on the surface of a cake. Spread your frosting over the cupcake bases using a small palette knife or pipe it onto them in spirals.